Two Book Friday! This week we have unicorns!!!! A few months ago we visited a store in Oregon and the little one got a stuffed Uni the Unicorn doll. 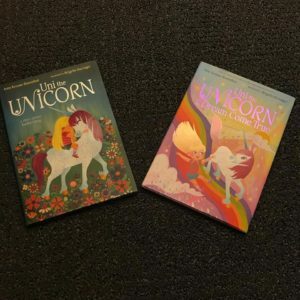 She didn’t know at the time that the stuffed animal is a character in actual books so this week she gets the two Uni the Unicorn books which are adorable and filled with great art. Team Jackson strongly recommends!